Mathilde and Mollie were both born towards the end of April this year. Mathilde came to us when only a couple of weeks old and has been hand reared. Mollie joined her when they were both about 4 weeks. As far as they’re concerned they’re sisters … they hang out together, play together, snuggle up to sleep together. They look like little yin and yang symbols curled up together. They’ll be vaccinated and microchipped at 9 weeks and ready to go to their new home a week or two later. 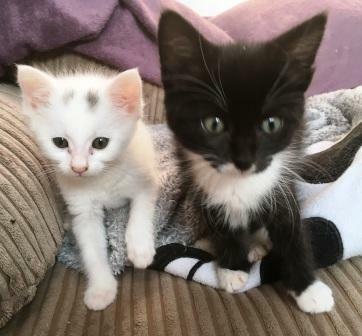 Once they are reserved for adoption we positively encourage families to visit several times to start to bond their their kittens and watch them grown. They’ll need to be kept indoors until at least 6 months old and they’ve been spayed. After that they’d like a safe garden to explore together. For safety reasons we very strongly recommend that cats be kept indoors overnight and always have access to an indoor litter tray. Because of their age and hand rearing, they’ve lived as part of two different familes (to share night time feeds and manage their care around work). Both families have multiple older cats who have shown them how to be a cat, and cuffed them when they’ve got out of line. One family also has visiting children age 8 upwards and a cat savvy border collie. So they’d probably fit happily into families with cats, kids and dogs who know how to behave around kittens. For safety reasons we do not allow families with very young children to adopt small kittens. All our adoptions bring 4 weeks insurance with Pet Plan.